The English contingent on this summer's British & Irish Lions tour of Australia will be reacquainted with referee Steve Walsh when he takes charge of the opening game of the trip against the Barbarians. England have sought clarification from the International Rugby Board over Walsh's performance during their record 30-3 defeat to Wales in Cardiff, which saw them miss out on a Grand Slam and the Six Nations title. Forwards coach Graham Rowntree, who will hold the same role with the Lions, was particularly unhappy with how Walsh refereed the scrummage, but will come face to face with the official at the Hong Kong fixture against the invitational side on June 1. Walsh's appointment was announced as the IRB confirmed the officials who will oversee the 10 fixtures as the Lions seek a first Test series win since 1997. The first Test in Brisbane on June 22 will be refereed by New Zealand's Chris Pollock, with South Africa's Craig Joubert and France's Romain Poite taking charge of the second and third Tests respectively. Joubert was another to come in for criticism during the Six Nations for his handling of Wales' win over Scotland, a match which included a record number of penalty attempts at goal. No officials from the Home Unions will take charge of any of the non-Test fixtures in a change from the last tour of South Africa where the likes of Wayne Barnes, Nigel Owens and Alain Rolland were utilised. Former Saracens fly-half Glen Jackson will referee the games against the Western Force on June 5, and Melbourne Rebels on June 25. Jaco Peyper of South Africa and Jerome Garces of France will also feature in the middle during the tour. IRB match official selection committee chairman, IRB Council member and former Scotland and Lions flanker John Jeffery said: "The British and Irish Lions tour will be one of the highlights of 2013 as far as international rugby is concerned and looks set to be another hard-fought and compelling series. 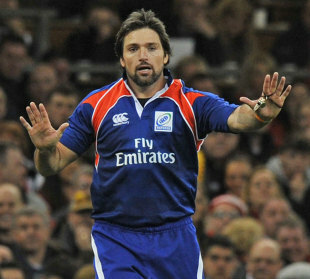 "The IRB is committed to promoting the very best refereeing standards at the elite level of the Game. The continued priority is the promotion of consistency and performance and following a comprehensive selection process, the committee has appointed three highly experienced match referees for the Test series."